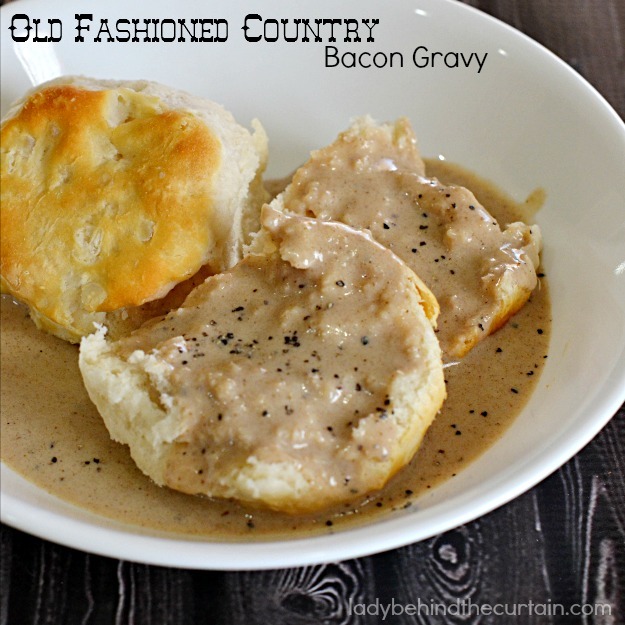 I grew up eating this delicious Old Fashioned Country Bacon Gravy. I remember my grandma making it even for dinner with fried potatoes and boiled beans. COMFORT AT ITS FINEST! Mom will make biscuits and gravy for us (It’s my Dad’s favorite meal) when we come to visit. It’s a treat for my Dad because he doesn’t get it very often (not a very healthy meal). But COMPLETELY worth being “bad” once in a while. 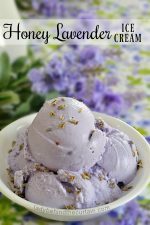 For me this recipe started with me enjoying it at my grandmas house. This is a recipe that my mom made, I make and now my daughter makes. I love those kinds of recipes. Four generations and going strong. 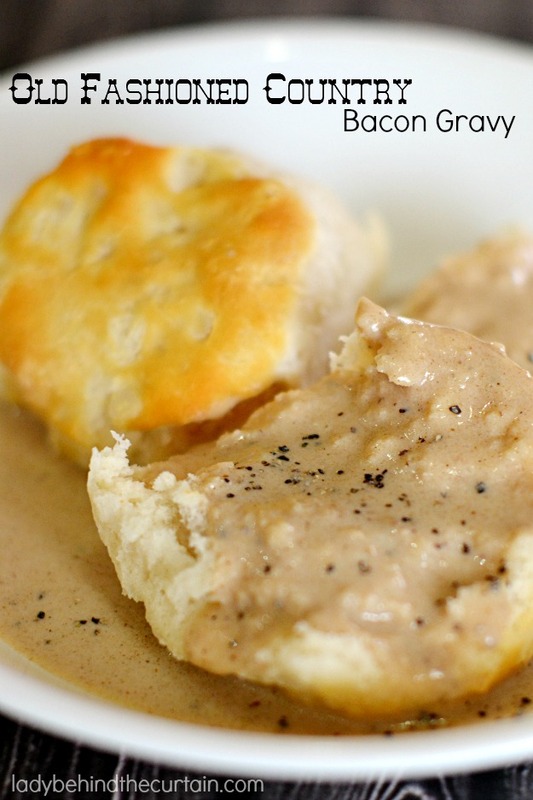 For the perfect breakfast pour this delicious gravy over my Sour Cream Biscuits. I don’t quite understand why restaurants only serve sausage gravy and not bacon gravy. I’m not a fan of sausage so bacon is my choice. 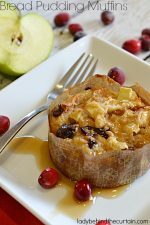 This is the PERFECT breakfast treat for overnight guests. The gravy can be made the day before or even a couple of days before. You may need to add more milk because once the gravy gets cold it will solidify and thicken. Just heat up in a medium sauce pan and whisk in more milk if needed. The key to a good gravy is the browning of the flour. Pour reserved bacon drippings into a large skillet. On medium high heat the drippings. Sprinkle flour over hot drippings. Whisk until the flour is brown. Add milk about a half a cup at a time, whisking the whole time until 4 cups have been added. TIP: If the gravy is too thick continue adding more milk ONLY 1/2 cup at a time until the right thickness is reached. 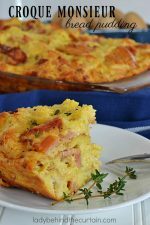 THANK-YOU FOR SHARING THIS RECIPE. I GREW UP EATING BISCUIT’S AND GRAVY. WE JUST MADE MILK GRAVY WITH THE PAN DRIPPINGS FROM WHATEVER BREAKFAST MEAT WE WERE USING THAT DAY. I LIKE BOTH BACON AND SAUSAGE. WHEN WE HAD HAM MY MOM WOULD MAKE STREAKED GRAVY (HAM GREASE AND HOT STRONG BLACK COFFEE). THAT WAS ALWAYS MY FAVORITE EVEN THOUGH I HAVE NEVER BEEN A COFFEE DRINKER. 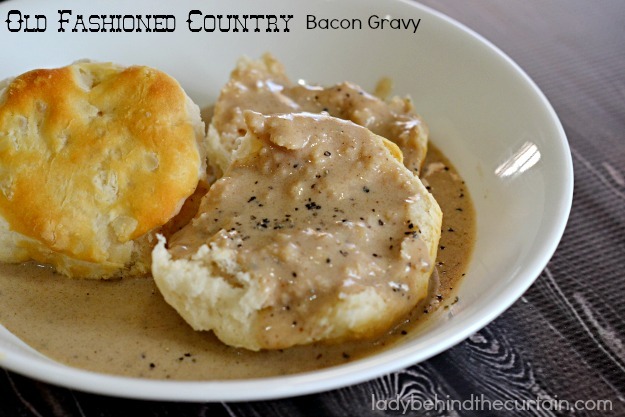 I grew up eating both (bacon & sausage gravy), but my grandmother would cook more of the bacon gravy. It was always so good, of course Grandmothers always made the best food. I agree with you completely about bacon Gravy vs sausage Gravy! I would order it in a second, if restaurants offered it! I really need to make it again! I’m the only one that loves it…but I don’t care!!! D you know of ANY restaurants that do have Bacon Gravy??? Hi Bill, I wish…..but no, I’ve never been to one. Little Princess Restaurant in Cherokee, NC. Never heard of it before then. Wow Kay you found a Restaurant that actually served bacon gravy! That’s great! I just went to a restaurant this weekend in Olympia, WA called Hash that serves bacon gravy on their biscuits AND their chicken fried steak! I never had it before and I am now HOOKED! I pretty much can never settle for sausage gravy ever again, lol! You are so right Randi. There is no comparison! I grew u[ with biscuts & bacon gravey like most people on here. My grandmother was the best cook if you like fried food she was the best! only problem is she did everything from her head I don[‘t think I ever remember seeing her use a mesuring cup. she could whip up biscuts from scratch never measuring a thing. 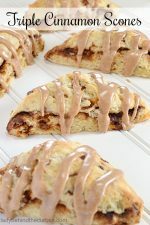 unfortunately she passed before I was interested in watching her make her biscut (bacon grease)gravey….so, this site has helped me understand some of the reasons mine was in consistant… THANK YOU! 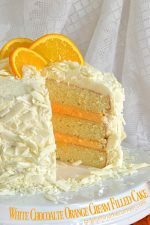 I’m so HAPPY you found this recipe too! My grandma was the same way. She always had a pot of bacon grease on her stove top. Hahaha….those were the days when we didn’t care that everything had bacon grease in it. I don’t think I new how green beans really tasted until I was an adult. LOL……. 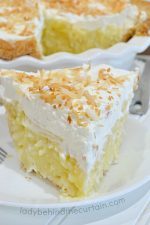 Just wanted to say thank you for this easy recipe Sheryl. I agree with all other comments on this. Same as my grandma’s gravy. Thank you for making it easy! WooHoo David! I love this recipe not just for the memories but there’s no other gravy recipe like it! At our house we called it burnt flour gravy. Cooked the same way but my grandmother added a touch of garlic powder. Still one of my favorites for my family. That’s cool Debbie. I’ve never heard it called that before. Love that you shared a memory with us! Thanks! For years I made bacon gravy but mine never tasted as good as my grandmas. When she passed I got her cast iron frying pan n that was the secret I missed all these yrs. The bacon will cling 2 pan n that creates a better flavor 4 gravy! Awww…such sweet memories Judy! I’m glad you discovered the solution. Thank you for the recipe. 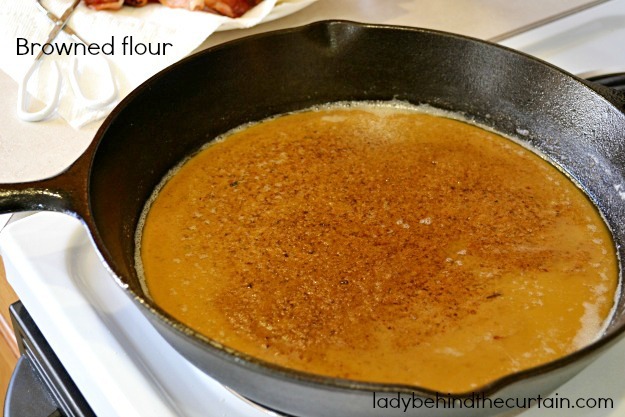 I’m going to try it, I remember my mom making something similar, we called Texas sweet gravy. Bacon drippings flour, no milk…water instead, salt and pepper. She grew up poor, milk was not to be put in gravy. We also sprinkled sugar over the gravy after we poured it on the biscuits. Fabulous!